M.P.B. Builders, Inc. is located in Ripon, Wisconsin. 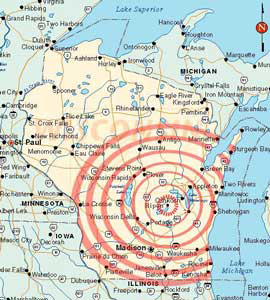 Ripon is centrally located between Green Bay, Milwaukee and Madison. The circles of the map show the general area in which M.P.B. Builders, Inc. travels for construction projects. M.P.B. Builders, Inc. will travel outside of this area but generally we work in eastern Wisconsin and northern Illinois.